Baseball player Mickey Mantle (known as "the Mick") won four home-run championships, a Triple Crown (highest batting average, most home runs, and most RBIs [runs batted in] in one season), and three Most Valuable Player (MVP) awards during his eighteen-year career with the New York Yankees. Mickey Charles Mantle was born on October 20, 1931, in Spavinaw, Oklahoma, to Elvin ("Mutt") and Lovell Richardson Mantle. A former semi-pro (professional but independent of Major League Baseball) baseball player, Mutt Mantle named his first child after Detroit Tigers catcher Mickey Cochrane. Mickey was barely out of diapers before he was practicing baseball with his father. Mutt taught his son to be a switch-hitter: Mickey would use his natural right-handed swing against his left-handed father and then turn around and bat left-handed against his right-handed grandfather. Mantle played baseball, basketball, and football at his high school in Commerce, Oklahoma. During one game, however, he was kicked in the leg and developed osteomyelitis, a bone disease that would later affect his baseball career. Mantle attracted the attention of New York Yankee scout Tom Greenwade, who signed him to a contract of $140 a week with a $1,500 signing bonus. Mantle reported to the Yankees' minor league team in Independence, Kansas, in 1949 as a shortstop. After two years in the minor leagues, the Yankees invited him to their major league training camp. He earned a place on the roster, and the New York media soon began comparing him to Babe Ruth (1895–1948) and other past Yankee greats. Only nineteen years old and two years out of high school, Mantle did not immediately live up to the hype. He started slowly in his new position—right field—and was sent back to the minor leagues. Mantle's difficulties continued when, in 1952, his father died of Hodgkin's disease, a form of cancer, at the age of thirty-nine. Mantle had been very close to his father, and he took the death hard. Mantle was moved to center field when Joe DiMaggio (1914–1999) retired from the Yankees following the 1951 season. He began to adjust to big-league play, and in 1952 he batted .311 with 23 home runs and 87 RBIs. That season Mantle began to establish himself as one of baseball's best home-run hitters. During one game against the Washington Senators, Mantle hit a ball completely out of Griffith Stadium in Washington, D.C. Measured at 565 feet, it is believed to be the longest home run ever hit. The New York Yankees won the World Series during each of Mantle's first three seasons, from 1951 to 1953. 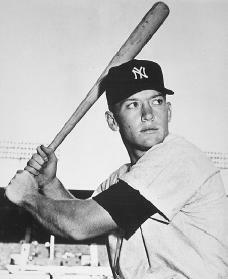 During the 1952 World Series against the Brooklyn Dodgers, Mantle batted .345 with two home runs. In the 1953 Series, again against the Dodgers, he batted only .208 but hit two more home runs. Mantle's talents led the Yankees as they ruled throughout the late 1950s. They won the American League pennant each year from 1955 to 1958, taking the World Series in 1956 and 1958. Mantle became a genuine superstar in 1956 when he won baseball's Triple Crown, with a .353 batting average, 52 home runs, and 130 RBIs. He was also selected the American League's MVP. In 1957 he hit .365 and was again named the league MVP. record (later broken by Mark McGwire in 1998, then Barry Bonds in 2001). Mantle continued to excel even though his legs hurt most of the time from the osteomyelitis and other injuries. In 1962 he was named American League MVP for the third time. Although the Yankees continued to win pennants, their days of glory were coming to an end. They lost the 1963 World Series to the Los Angeles Dodgers and the 1964 World Series to the St. Louis Cardinals. By 1965 the Yankees's run was over. Mantle became unhappy with his pain and with his many strikeouts. During the 1965 season he said, "It isn't any fun when things are like this. I'm only thirty-three, but I feel like forty." Mantle continued to play through the 1968 season; he announced his retirement in the spring of 1969. Mantle left the Yankees with many great achievements. In addition to hitting 536 lifetime home runs, he led the American League in homers four times and was chosen as its most valuable player three times. He is one of only a few players to win a Triple Crown. He played on twelve pennant-winning and seven World Series-winning teams. He still holds the all-time record for home runs in World Series play (18) as well as numerous other World Series records. Mantle was a symbol of the Yankees and their greatness. In 1974 he was elected to baseball's Hall of Fame in his first year on the ballot (a list of players who are eligible to be voted into the Hall of Fame). After retiring from baseball, Mantle pursued a business career, opening a restaurant and working in public relations for a casino in Atlantic City, New Jersey. He also made appearances to sign autographs and play in golf tournaments. His experience in television commercials and small film roles led to a job as a broadcaster for televised Yankees games. His career and personal life was marred by alcoholism, however. Mantle had married Merlyn, a bank employee, in the 1950s, and they had four sons. Mantle was absent for much of their childhood, however, and he had a reputation for his all-night drinking. He and his wife separated in 1988. Their son Billy died of heart failure in March 1994 after being treated for Hodgkin's disease, the same illness that had taken Mantle's father and grandfather. Earlier in 1994 Mantle learned that his years of heavy drinking had left him with hepatitis (a swelling of the liver) and liver cancer. Although he received a liver transplant in June 1995, the cancer had spread to other organs, and Mantle died on August 13. His outstanding abilities and courage in the face of pain made him a hero to a generation of youngsters and adults alike. Castro, Tony. Mickey Mantle: America's Prodigal Son. Washington, DC: Brassey's, 2002. Gallagher, Mark. Explosion! Mickey Mantle's Legendary Home Runs. New York: Arbor House, 1987. Mantle, Mickey, and Herb Glick. The Mick. Garden City, NY: Doubleday, 1985. Mickey Mantle. I thought, yea right?, today I,m positive that it was him. After it came out about his illness and his death and saw more recent photos of him, I feel proud of this memory and his down to earth soul. A great man with all the human failings and vulnerabilties as everyone else on the planet. Life is difficult,sooner for some than others,but we all have to endure loss of family and friends at some point and self medicating is common;and so often it's the kind ones and those who pine for the ones they miss that succumb to the addictive power of drink or drug. He is remembered by me for his warmth and kindness. he is my hero and i wish he was still alive because it would rock!! !